Exposed during dredging operations in 1970, the Arade 1 shipwreck was photographed and inspected by amateur archaeologists during the subsequent summers. Since there were very few artifacts, this wreck was quickly forgotten and left abandoned. During the decade that followed the Arade 1 hull slowly decayed, broke flat, and was covered by sediments. In the summer of 2001 the now extinct Centro Nacional de Arqueologia Náutica e Subaquática (CNANS), which was at the time the Portuguese agency for Nautical Archaeology, invited Texas A&M and the Institute of Nautical Archaeology to co-direct a project of survey and excavation of several sites on the mouth of the Arade River, near the city of Portimão, in Portugal. The Arade 1 shipwreck was located and an agreement was secured with the local municipality (and museum) for a long-term project, designated ProArade. Our proposal for the realization of a field school was accepted as part of the larger project. The mouth of the Arade River has been inhabited since at least the Iron Age. It is believed that during the 6th century BC this area possessed a fairly important harbor -Portus Hanibalis – built by the Carthaginian general Amilcar – the father of Anibal – either on the very mouth of the Arade River, or on the nearby small inlet of Alvor. Later, a predominantly rural Roman occupation of this area is well documented by the ruins of several Roman rural villas. Fig. 1 – The west coast of Algarve showing Portimão and its surrounding area. During the subsequent Arab occupation of this territory – from AD 715 to 1250 – the village of Silves, a few miles upstream, became an important urban center, and traffic on the Arade River intensified. In AD 966 a fleet of 28 Viking ships was sighted of the coast of Portugal. A Muslim fleet left Seville as soon as possible and engaged the “infidels” in the Arade River. According to the chronicler many Vikings were killed and many vessels sunk. The remaining enemies fled, and the Arab prisoners that had been already taken were rescued. Portimão was certainly not more than a small settlement, or even just a number of scattered houses on the landscape. An account of the conquest of Silves by an anonymous crusader who took part in it in 1189 mentions the destruction of Alvor, where the castle was burned and the entire population – 5.600 people – was put to death, and the burning of a number of country houses at the mouth of the Arade River. There the land was well cultivated, but nobody was in sight at the time of the crusader fleet arrival. Fig. 2 – Mouth of the Arade River in 2002. In the 13th century the Portuguese conquest – the so-called Reconquista – of the southern portion of today’s Portugal, named Algarve, brought new settlements and new settlers to the mouth of the Arade. From a small settlement in the mid-13th century, it became a village with about 40 households in 1463, named São Lourenço da Barroza, and possibly dedicated to the fishing of tuna, an ancient activity in the region. On a curious note, the remains of this early settlement are said to have been exposed on November 1st 1755, after a series of tidal waves – which are said have been over 10 m high, and followed the earthquake that stroke Portugal on that morning – hit the mouth of the river. Because it was very exposed to pirate incursions, the village was fortified with walls in the second half of the 15th century. By 1615 there were 1802 inhabitants in Portimão, which was only one of five settlements situated nearby: Alvor, Silves, Estombar, and Ferragudo. Two fortresses were built in the first decades of the 17th century in order to protect the river from constant incursions of Muslims and Protestants. By 1622 the mouth of the Arade River was protected by the fortress of São João on the left margin and the Santa Catarina fortress on the right margin of the river. In spite of the two small sand banks that divided the river into three channels until the early 20th century, this river was navigable upstream past the city of Silves as late as the 17th century. The 1755 tidal waves are said to have caused major changes in both the course and the shape of these channels. The river course is said to have shifted about 1 Km west after November 1755’s earthquake. In spite of the progressive silting of the river the largest channel – the eastern one – was still 4.8 m deep on the high tide periods as late as the 18th century. All these centuries of occupation and maritime activity made the mouth of the Arade River an enormous garbage dump. Many artifacts were thrown, abandoned or lost in the river during the more than 25 centuries of documented human activity on this area. After the first major dredging works, carried out in this area between June and November of 1970, the mouth of the Arade River fell under the attention of beachcombers and artifact collectors. The sand removed from the river was deposited on the nearby beach, called Praia da Rocha. Since 1970 perhaps thousands of artifacts were found there by tourists, fishermen, local beach restaurant owners, and interested collectors. Some made it to the museum of Portimão, some were lost for lack of conservation treatment, and some were sold in the antique markets. More important than loose artifacts were however the several hull remains which are reported to have been hit by the dredges in that year. Five or six shipwrecks were exposed during the dredging works in 1970. Fig. 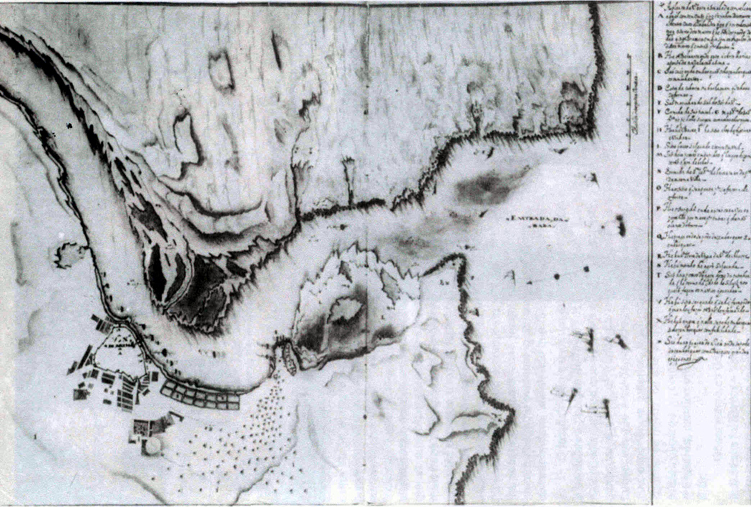 5 – 17th-Century map of the mouth of the Arade River. Then, in 1980, dredging works were responsible for the complete destruction of at least another shipwreck. The decade of the 1990s would witness more dredging works at the Arade River mouth, but this time the sediments were deposited in the sea, making it impossible to know what or how much was destroyed. Finally, dredging for the construction of a sports harbor – which was followed by a team of archaeologists – lead to the destruction of another three shipwrecks that laid buried on the left margin of the river, although of quite recent origin and allegedly of no archaeological interest. The balance of the dredging interventions on the Arade River estuary in recent times looks quite sad. Mostly when we consider the attitude of the port authorities in the last three decades of the 20th century, ignoring the popular pressure to stop the destruction of the local cultural heritage, and carrying on the destructions arrogantly in total disregard of the press and the local groups of pressure. One of these groups, named Grupo de Estudos Oceânicos or GEO as it is generally referred to, has been very vocal in their protests against the destruction of Portimão’s underwater cultural heritage. After the creation, in 1997, of the Centro Nacional de Arqueologia Náutica e Subaquática (CNANS), a state agency for nautical archaeology, the status quo changed substantially in Portugal in what pertains to the protection and study of its underwater cultural heritage. In collaboration with GEO the state archaeologists promoted and organized a campaign of survey and excavation of the Arade shipwrecks, starting in 2000. Some of the Arade ship remains may have been destroyed forever, and some have yet to be located again. However, others were already located in the survey carried out by the GEO team during 2000 and 2001, which covered an area close to 1,000,000 m2. In the summer of 2001 a team of CNANS and GEO – in which I was included, after an invitation from Dr. Francisco Alves, director of CNANS – initiated the excavation of several sites located by GEO in the previous two years. The results were extremely promising, and another field season was planned for the following year. Four sites were excavated and recorded during the summer of 2002 by a team gathering divers and archaeologists from four different institutions: the Portuguese Centro Nacional de Arqueologia Náutica e Subaquática (CNANS) and Grupo de Estudos Oceânicos (GEO), the Brazilian Universidade de São Paulo, and the Institute of Nautical Archaeology / Texas A&M University. In the present report we intend to focus on the Arade 1, Arade 2, and Arade 6 shipwrecks. It looks like the Arade 2 shipwreck of 1970 actually corresponds to two different shipwreck sites. As already mentioned above, during the dredging works of 1970 five hulls are said to have been partially destroyed. Two groups of sport divers visited two different shipwrecks each during in October 1970, and it has been assumed that these are the same two sites. However, it seems that there were at least six shipwreck sites, and that the first group of divers – from the Centro Português de Actividades Subaquáticas (CPAS) – visited indeed the sites of shipwrecks Arade 1 and Arade 2. The second group of divers, however, – from the Federação Portuguesa de Actividades Subaquáticas (FPAS) – seems to have visited the sites of shipwrecks Arade 1 and Arade 6. According to the testimonies of Mrs. Margarida Farrajota and Mr. Helder Mendes – who in 1970 were part of the first and the second group of divers respectively – the director of the harbor authority ordered the dredging works to stop upon learning from the captain of the dredge Mark that he had hit two shipwreck sites. Still according to these witnesses, the port authority director called Mr. Jose Farrajota, the local delegate of Junta Nacional de Educação, which was the organism in charge of antiquities in Portugal at the time. An archaeologist and member of CPAS, Mr. Jose Farrajota visited the site on October 10 and 11 1970 with a team which included his daughter, Margarida Farrajota, Rui de Moura, Fernando Pina, and Jorge Albuquerque – then president of CPAS. Mr. Helder Mendes, a national television director and member of the second diving group of divers – FPAS – was invited to join this team on the first day. Mr. Farrajota’s team inspected the Arade 1 shipwreck site but could not see the Arade 2 site, for it had been covered with sediments during a recent storm. Later that week a team from FPAS also carried out a series of independent dives on the Arade 1 site, and found what we now believe to be a sixth shipwreck: Arade 6. These diving expeditions produced a series of pictures, sketches, and measurements that have been extremely useful thirty years later. On the CPAS expedition Jorge Albuquerque and Fernando Pina took pictures and measurements and produced two good sketches of the Arade 1 vessel. We have six pictures from Jorge Albuquerque, and thirteen from Fernando Pina. Mr. Jose Farrajota wrote a report, and his daughter took extensive notes. On the FPAS expedition, which included Helder Mendes, Ricardo Costa also took pictures – two roles of film, of which we have twelve pictures. Two years later, Mr. Helder Mendes produced a documentary for national television which was aired on July 4 1972 under the title The Mysterious Ships of the Arade River. During the investigations carried out by Dr. Francisco Alves, which included the analysis of an extensive file existing in CNANS’ archives, and interviewing Mr. Helder Mendes it became clear that the Arade 1 shipwreck site was the same for both groups of divers. However, for the FPAS’ group the Arade 2 shipwreck was a lapstrake built ship presumably located upstream and near the Arade 1 site. For the CPAS group the Arade 2 site was located downstream, near the left jetty, and it was never actually visited since it had been already covered by sediments by October 10 1970, when it was inspected. There are therefore no doubts that the Arade 1 was a flush laid hull, corresponding to the “position 1” on Fig. 19. As to the Arade 2 shipwreck, Mr. Farrajota marked it clearly near the jetty, in an almost symmetrical position relatively to Arade 1 on the basin dredged. Mr. Helder Mendes, however, is under the impression that it was located upstream from the Arade 1 site, possibly near the position marked on Fig. 20 as site “C”. And he is sure that it was lapstrake built. A third witness, Mr. Luis Sacramento, a local diver and an old time friend of Dr. Alves, claims that Mr. Albuquerque’s Arade 2 site had several guns, one of which – in bronze – was last seen on the deck of one of the dredges. Fig. 23 – A1, B1, B2, and C areas. In spite of the sketches made at the time, and the pictures taken, thirty years later it was very difficult to make full sense of them. In the summer of 2001 a joint survey carried on by CNANS and the GEO group, with the help of Mr. Helder Mendes, lead to the discovery of several ship remains near the Arade 1 shipwreck area marked on CPAS report of 1970 (Fig. 20). The areas defined on this survey were designated as A1, B1, B2, and C, and several trenches were opened around them during the 2001 field season. Area A1 yielded the remains of a ship’s hull, and its excavation started immediately under the direction of Dr. Francisco Alves, carried out by a joint CNANS / GEO team. On area B2 a frame from a lapstrake hull was found (Fig. 22) together with some lapstrake planking. We know now that the A1 vessel is the Arade 1 shipwreck, but so far failed to find the Arade 6, lapstrake-built, shipwreck. Fig. 24 – Frame found on B2 area. Already an old admirer of both Margarida Farrajota, and Helder Mendes, I am greatly indebted to them for their patience and willingness to search into their memories for the details of this old story. I must thank again Margarida Farrajota, presently president of C.P.A.S., for all the data supplied. In CNANS’s archive, thanks to Helder Mendes and Alberto Machado. Radio Televisao Portuguesa, “Os misteriosos barcos do rio Arade,” by Helder Mendes. Mr. Luis Sacramento personal communication. Photo: Francisco Alves (CNANS archive).